I learned a few days ago that this site is called "Champ de Foire." I'd read the accounts of what had happened here in 1940, but I thought it was another field, somewhere else. Surely not on this tranquil ground. Not where we've enjoyed picking up giant plantain leaves every fall and remarking about how enormous they are. 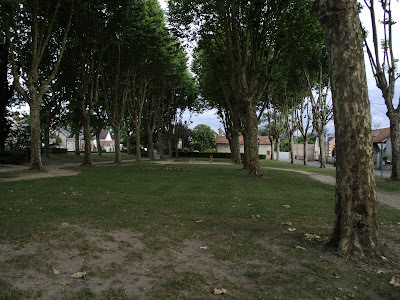 Here, where we see the remains of the Véron orchards. This is where one of our town's worst tragedy during World War Two struck. A foire can be a fair, but it can also mean a mess. 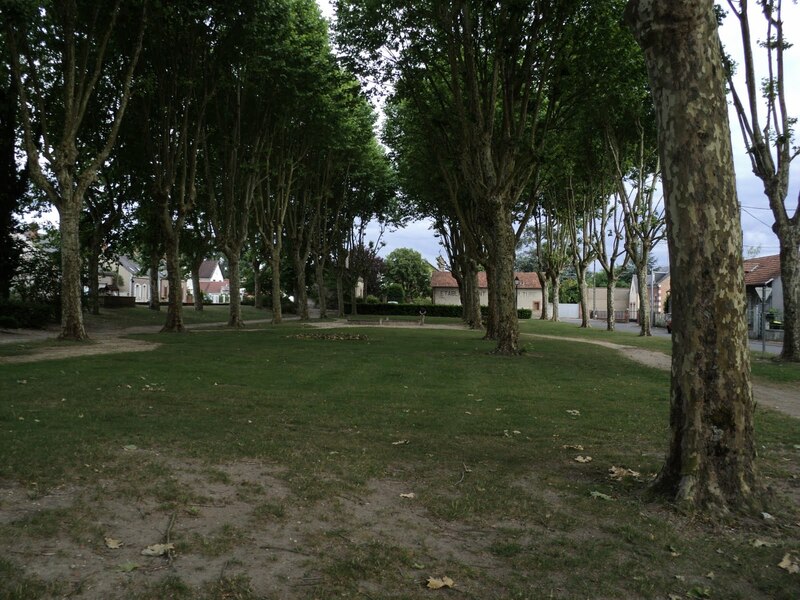 And on June 16, 1940, just a day after planes wreaked havoc on La Ferté Saint Aubin, the horror struck again. Refugees were trying to traverse National Route 20 just to the left of these greens. Others were camped out here beginning their lunch when several waves of planes launched their attack around 12:30 p.m. People hid under chariots, trucks, threw themselves on the ground. It was impossible to run, says one witness. "Grand panic." Seventy-four victims were identified. A letter written to the La Ferté mayor said the author's mother had endured eight bombings during her exodus, but the one in La Ferté had been the worst. Some victims were buried in their place and others on the castle grounds. Many of the dead were from Paris and Orléans. Witnesses in La Ferté say the planes were Italian, and that they saw tricolored insignia on the planes. Italy had declared war on France on June 10th... Some dispute that claim, and say they were likely German. Fertésiens had not yet abandoned the town in droves. They were still hopeful. But following these tragic days, many joined the flow of refugees.